The Easy French Reader book is a great beginner book, but it is also perfect for the more advanced French students who want to know more about French history or would like to discover some French classics. This book is also available in electronic format, so you can easily add notes as you read along. From the Back Cover: Learn how to read in French--starting right now! "Easy French Reader" begins with the adventures of two friends, an American and a Parisian, as they learn about their respective cultures. As you read about their experiences, you'll discover the nuances of language and culture right along with the students. The next section contains a colorful history of France, from ancient Gaule to the present, offering biographical sketches of famous personalities including Charlemagne, Joan of Arc, and Napoleon. 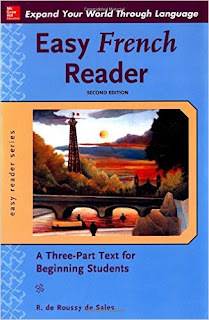 The final section features four abridged short stories by famous French authors that allow you to practice your grammar and vocabulary skills on authentic works of French literature. Progressive format makes it easy to quickly build comprehension. Marginal word glossaries conveniently present new words and phrases. Exercises challenge language comprehension and build reading skills.